a Department of Chemistry, National Dong-Hwa University, Hualien 974, Taiwan, R.O.C. b Division of Biotechnology and Pharmaceutical Research, National Health Research Institutes, Miaoli 350, Taiwan, R.O.C. A new and efficient procedure for the one-pot conversion of various aldehydes into the corresponding nitriles under mild reaction conditions has been developed. 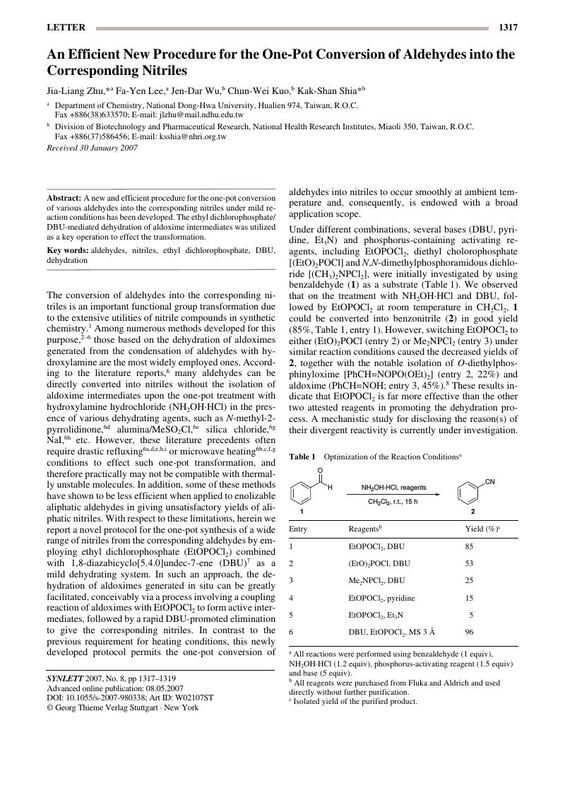 The ethyl dichlorophosphate/DBU-mediated dehydration of aldoxime intermediates was utilized as a key operation to effect the transformation.